The overall theme of the series, that of life as a current or former football player, is still there and the wheeling and dealing hasn’t changed that much, though the stakes seem to be higher this time around. HBO is known for quality television that engrosses audiences and keeps them coming back time and time again. The Sopranos, True Blood and Game of Thrones have all been award winners, just to name a few and the cable network has a strong history excellence in television. Occasionally they get a mildly entertaining series that has some appeal and every once in a while they just get it wrong. Ballers seems to fall somewhere in the middle ground, offering nothing groundbreaking or earth-shattering but manages to be entertaining nonetheless. With season four announced, season three is now in stores and available on Blu-ray, DVD, and Digital HD. When we walked away at the end of season two, Spencer Strathmore (Dwayne Johnson; the Fast and Furious series) had proverbially hit rock bottom (no pun intended). We see him entering a medical facility alone, ready to face his physical ailments after just having witnessed him eating a piece of humble pie at the NFL rookie conference. He seemingly has no career, is addicted to pain pills, and needs hip surgery. The level of drama in episode 10 of Season Two was immense and left me wanting more. And then came Season Three. Season Three opens with Spencer back in the office with Joe (Rob Corddry; Hot Tub Time Machine) under the guidance of Mr. Anderson (Richard Schiff; The West Wing) and seeing his doctor for a follow up after his surgery while alluding to the fact that he has kicked his painkiller habit. That's it. Nada- nothing else is mentioned about two of the most compelling character flaws Spencer had in Season Two and they have seemingly glossed over the fact that Spencer was not sanctioned by the League to actually work with the players. I was looking forward to seeing how these things would play out and by the time the audience gets back to seeing Spencer all is right in his world again. Meanwhile, the other members of the show have been relegated to the realm of subplots. Ricky (John David Washington; Malcolm X) is grappling with his newly discovered fatherhood, Vernon (Donovan W. Carter; Family Time) is making stupid investment deals, this time with a marijuana company and Charles (Omar Benson Miller; 8 Mile) finds himself in an awkward position as he takes on a job in the head office of the Miami Dolphins Franchise. However, they are all in the background as the big story revolves around Spencer trying to make a deal to move a League team to Las Vegas. It's obvious that the show depends on Johnson's charisma to keep it as popular as it is and hopefully he is paid handsomely because he deserves every penny, as he keeps the show afloat. While his acting is not award-worthy, he seems to get better each season and the third time is a charm as the saying goes. I sense more depth and emotion than I have in the past and I give him credit for the improvement. His fellow cast members compliment him well, especially Corddry. I have always felt he is a standout in this series and he continues to impress. The show also has some great guest appearances including Schiff and another West Wing alum Dule Hill (Psych) and the latest addition, Steve Guttenberg (Police Academy). There are some subtle changes that, in my opinion, are unwelcome. The move of filming location is apparent to anyone who lives in the Miami area and it gives the show a different feel. The writing also seems a little different, especially in the first episode. It seems raunchier than previous seasons and, frankly, was a turn off for me. The Blu-ray offers nothing in the way of extras. While past seasons have included the "Inside the Episode" feature, it is absent this time around. The 1080p video quality is excellent with the vibrant color radiating from the fake Miami sets. The DTS-HD Master Audio 5.1 is standard fare but seems to enhance certain scenes especially in Las Vegas. The overall theme of the series, that of life as a current or former football player, is still there and the wheeling and dealing hasn't changed that much, though the stakes seem to be higher this time around. While it is no Game of Thrones, it is a solid show that centers on an actor with an abundance of charm. 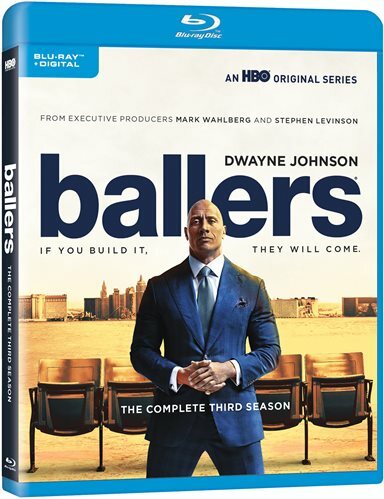 Download Ballers: The Complete Third Season from the iTunes Store in Digial HD.